I started this post in the Blogger app on my iPad, but it disappeared. Good thing I hadn't gotten very far! Anyone else use the app? I haven't used it much, and now I think I know why! I mentioned yesterday that Stephen Lawhead's Pendragon Cycle was my introduction to Arthurian fiction. I still love the books, and even have the audio books. The narrators are excellent. I may have to listen to them in the car, after my kids and I finish the series we're listening to currently. Since finding his King Arthur books, I've read nearly everything he's written. The two exceptions are Dream Thief and Empyrion. I don't know why I haven't read them; probably because they are old enough books that I haven't come across them in book stores. I also don't see many Lawhead books in thrift stores or in library sales. I think people really like him and don't get rid of his books often. He's also written some children's books I haven't seen. Stephen Lawhead was born in Nebraska in 1950. He is a Christian, and his faith comes through in most of his books. He and his family moved to England in 1986 to research his Pendragon books, and they currently reside in Oxford. According to Wikipedia, he was the manager for the Christian band, DeGarmo and Key! I'm sure I'm dating myself by admitting I listened to them, but I thought that was an interesting piece of his history. My favorite books are his Song of Albion trilogy. They are based on Celtic mythology, which I love. The story is just beautiful. The hero, Lewis, is a student at Oxford University. He learns that the Celtic knot, the border between our world and the Celtic Otherworld, is unraveling, and he ends up going into the Otherworld and becoming intimately involved in trying to save both worlds. He ends up gaining a new understanding of Christ's sacrifice, and I was blown away by the ending of the third book. I highly recommend it. In fact, it's time for me to read through these again. I have the audio books of these, as well, and they are well done. His King Raven trilogy, about Robin Hood, was excellent. It's a new take on the Robin Hood stories, and it's very cool. It has the mystic component I love in his writing. Byzantium, a stand-alone book about an Irish monk who loses his faith and finds it again, was riveting. I also enjoyed his story about St. Patrick, which is the only one of its kind he wrote. His Dragon King trilogy, some of his earliest work, were pretty good. Not outstanding, but they are worth reading if you're a Lawhead fan. I didn't particularly care for his Celtic Crusades books. I don't know why. They just didn't grab me. I've only read them once, and I don't remember much about them. I also didn't care for Avalon: The Return of King Arthur. It was just weird. His most recent series, Bright Empires, was excellent. I was surprised by how openly he wrote about Christ in the last one. God as the Creator is honored through the entire series, really, and in the last book, he was more...evangelical, if that's the correct word. It's not, really, but I can't think of a better term. I also felt there was a maturity in his writing that I hadn't seen before, and I suppose after surviving a cancer diagnosis, that makes sense. 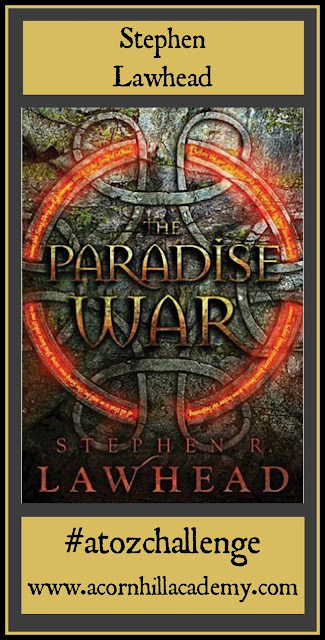 I'd love to know if you've read any of Stephen Lawhead's books, and which are your favorites, if you have. If you're looking for a new author, do check him out. I can lose myself in his stories, and that, to me, is what makes a great book.